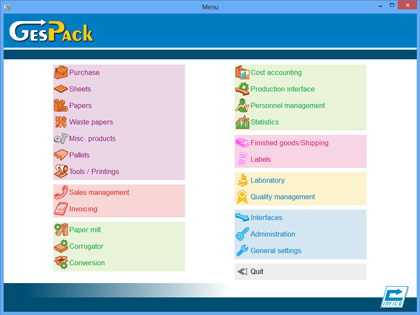 GesPack is an Enterprise Resource Planning developed especially for the cardboard and packaging industry areas in order to offer an global and efficient solution. 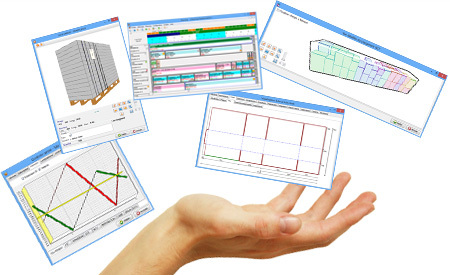 Our collaboration, for more than 25 years, with professionals of the cardboard industry allowed us to develop a software package perfectly adapted to the needs of all its areas and its derivatives. Papermaker, corrugator, convertor, printer, tools and clichés makers… We master your activity specificities and we can offer you our solutions. Our great experience within our customers’ plants has helped us understand that no site works in the same way. Consequently, we started listening to our customers to help them in adjusting GesPack to their specificities. Today, we created more than 20 application dedicated to our unique customers only to improve their efficiency. We are proud of this flexibility and this responsiveness. Because GesPack can be adjusted perfectly to your needs, it can work on several different ways. You can completely personalize it, select the applications you want in order to hide those that do not fit to your needs, and we can create the applications you need if it does not exist yet. Thus you are monitoring the way you want to use your ERP. Our way to work consists in proposing you a right price, according to the applications you want to use. The future developments will always be subject to a cost study before their implementation so that we work together in a fully budget transparency. Therefore, we will constantly listen to you in order to maintain your data processing and to be sure to improve it according to your requests. 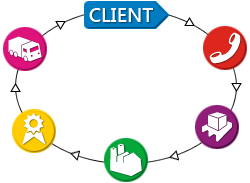 This permanent service that we provide acts like an annual subscription for project monitoring and after sale service. We support you, during the GesPack installation in your plant being present on site during the crucial weeks of starting, then keeping on listening to you for each step of your progress. We train you to the software package use to ensure its perfect operation. Usually, its installation within a plant lasts about three months. GesPack is perfectly adapted to a multi-sites management of your infrastructures. 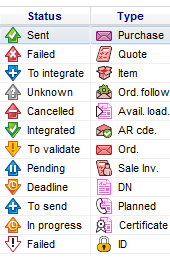 You can send PDF documents by mail and fax from GesPack while dealing (sales, invoices, shippings, purchases) with your customers, suppliers or providers, in order to save time and paper. Others systems are supported by GesPack (AS/400, PC-Topp…) and are able to communicate with each other via EDI (Electronic Data Interchange). GesPack also manages the sending and the reception of structured files on different formats (XML, TXT, CSV…) allowing an electronic process with your contacts. GesPack can be adjusted to your company structure. If you own several plants, some interfaces make the link between each plant in order to consistently share the technical and commercial knowledge. GesPack can be interfaced with your providers and customers data processes, thanks to the market standards. INFICO develops GesPack with its customers’ partnership for more than 25 years and is granted with an unmatched experience with the users. Our developing team allows us to answer quickly to the customers’ requests. Besides the on-site interventions, INFICO provides a telephone support and a remote maintenance, in order to obtain an optimal reactivity according to your needs. 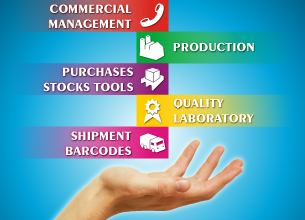 INFICO helps you in the choice of your material infrastructure, from the servers to the workstations through the bar code readers. 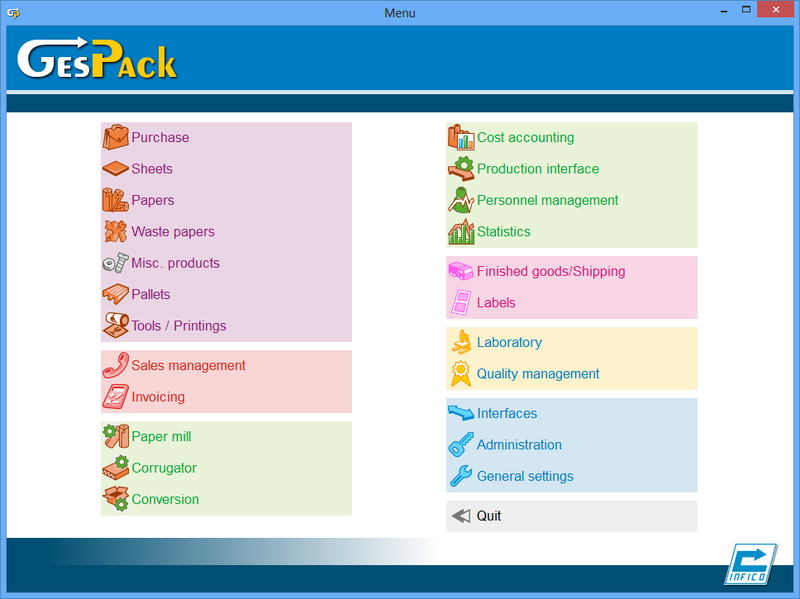 GesPack is your ERP, you completely set it up in order to adjust it to your needs. As a unique system ensuring the good operation of your plants, we think that your criteria must be taken into account while its installation and throughout its development.